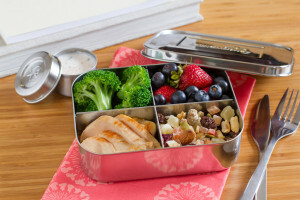 With school starting back up, I thought I’d offer some snack and lunch ideas to make the transition a bit smoother while maintaining healthy and nourishing menu options. You can follow these closely or not: adjust to your taste buds. Try to have your plate be mostly vegetables (raw and cooked) with 4 -6 oz of a lean protein and your snacks to have a protein and/or a plant fat (avocado, nuts, seeds, or coconut for example). Snacks: Most of these are quick and require little preparation. Others require a bit of planning but remain easy in their prep to set you up for the week. You can always consider doubling some of the recipes to carry you through the week. 1. Nuts & Seeds. It’s best to mix these up and keep the portions small (1/4 cup is plenty) – it’s so easy to just keep eating. 2. Apple with almond butter – 1-2 tbsp of almond (or other nut) butter will add good fats and protein to balance the natural fruit sugars. 3. Turkey slices with avocado – make sure you choose a healthy deli meat option: no nitrates, no antibiotics, gluten and dairy free. Also check the sugar content and sodium – especially if you are sensitive to salt or have elevated blood pressure. Applegate is a brand with more sustainable and healthy options. You can substitute slices of chicken or turkey breast (cook extra chicken or turkey breasts at dinner the night before). 4. Celery and almond butter – keep the nut butter to 1-2 tbsp. 5. Carrots/celery/cucumber and hummus (if you tolerate legumes). 7. Plant based protein shake – use a half serving for a snack and just mix it with water or a milk alternative: coconut, hemp or almond milk. 8. Breakfast cookies – the recipe is here: http://againstallgrain.com/2012/03/18/breakfast-cookies-paleo-scd/. She has many great paleo friendly recipes on her website. 9. Applesauce (1/4 cup) with 1-2 tbsp pumpkin or sunflower seeds. 10. Jerky – make your own or take the time to find one that is gluten free and without excess preservatives, sugar and sodium. 11. Chia coconut cream pudding: Blend one can of coconut cream, 4-5 pitted dates, 2 tsp vanilla extract, ½ cup organic cocoa powder and 1/3 cup chia seeds in a food processor or blender. Transfer to a bowl and refrigerate. A serving is ¼ to 1/3 cup. – Bake 20-25 minutes or until well browned. – Move to a wire rack to cool, keep in an air tight container in the fridge. – Sauté vegetables in a high heat oil (coconut oil, walnut oil, organic grass fed butter) until soft. Add Kale/collards/chard at the very end. – Place egg whites into a bowl and whisk well. – Add sautéed veggies to egg whites. – Optional lean protein: turkey, chicken, sausage etc. – Divide mixture between 4-6 muffin cups. – Bake at 425°F for 30 minutes, or until puffy and crisp. – Store in an airtight container in the fridge. 14. Protein bars – the recipe can be found here. Cut them in to small squares as they are calorie dense, and very tasty. Lunch: Some of these will require some additions to your lunch box (vegetables, nuts, fruit, etc.). A food processor is great for shredding beets, carrots or cabbage ahead of time as they keep well for many days. You can add to your salads and sandwiches, or eat them all as a salad with your favorite dressing. 1. Salad with protein (hard boiled egg, tuna, chicken) – you can buy pre-made salad mixes or prep the lettuce and any added vegetables before the start of the week and store separately until the night before or day of to keep things from getting soggy. 2. Turkey with avocado – also good wrapped in lettuce. 3. Lettuce ‘sandwiches’ – use any and all of your favorite sandwich ingredients and wrap them in butter lettuce leaves or collard leaves. 4. Left overs – cooking extras at dinner is great for a quick lunch. 5. Raw zucchini noodles – spiralized and lightly tossed with olive oil, salt and pepper. Adding shredded beets, carrots or cabbage, sunflower seeds, a protein or a peanut sauce are good additions. 6. Tuna with plantain chips or cucumber slices. I prep my tuna with salt, pepper and some spices. Others add salsa or the tried and true mayonnaise. Avocado slices go well with this. 7. Mini burgers (beef, bison, chicken, turkey) – make ahead and wrap up in lettuce, add avocado slices or quacamole. Use ground flax seeds instead of eggs to increase the fiber. (1 egg = 1 tbsp of ground flaxseeds in 3 tbsp of warm water).